Positive, respectful, hardworking. 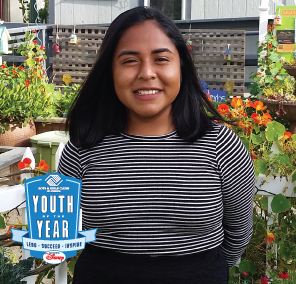 Those three words are just the tip of the iceberg when it comes to describing our outstanding Club Teen, Yvette. Her story begins in extremely tough conditions, her single parent family faced significant economic hardship and Yvette as a first generation American, faced personal health issues since birth and found herself having a hard time fitting in. Through all of this, she was still determined to help herself, Mom and two sisters create a better life for themselves. Like everyone in this world, I have had many difficulties in my life, but unlike everyone else I have had a great group of people at BGC San Dieguito to help me overcome those difficulties. The day I was born I was diagnosed with Adrenal Hyperplasia. The symptoms of this diagnosis included a “failure to thrive in stature,” as the doctors phrased it. Growing up, my childhood consisted of four white walls with a curtain separating me from all the other patients. I saw more nurses and doctors and needles and pills than I had seen my father. As an attempt to become a normal child, I attended school with everybody else. I was different but at that time it was not something to be proud of so I was bullied a lot. Throughout this there were also some problems at home. My father disappeared from our lives for good. Our struggles were beginning to grow and affect our lives. Suddenly school became more challenging, I felt lonelier and instead of school being a nurturing safe environment it felt like a toxic space where I was an outlier. Soon enough though, I found hope in BGC San Dieguito. I was no longer alone, I was no longer sad, and I was no longer the little girl that would walk around in public spaces with her head down. Suddenly it didn’t matter that I was too short for everyone else, it didn’t matter that my family was incomplete. Through the love and care of the staff members I have learned that our differences are what make us important. I have learned that there is nothing more powerful than family, because family is the root to all the source of light, and with light comes success. My family is different. My family is much greater and happier than the mainstream family: my family is the Boys & Girls Clubs of San Dieguito.